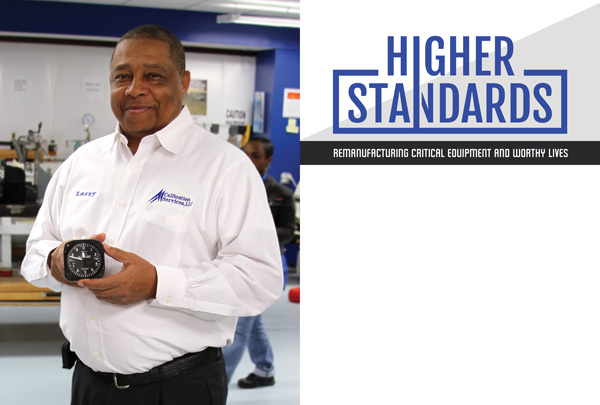 Navy veteran Larry White is the owner of AA Calibration Services, LLC, an airline equipment remanufacturing and calibration business that specializes in altimeters, airspeed indicators, and vertical speed indicators. Since 2004, AA Calibration has continued to grow, and now makes its home in a 5,000-square-foot facility in Yazoo City, Mississippi, constructed from the ground up in 2010. White’s is a story of successfully building a manufacturing business using his wits and his savings, one step at a time, with an attitude of self-sufficiency that is now embedded in the company’s culture. Today the company supports White’s family along with 18 employees and their families. Larry White has a saying, “Adapt. Adjust. Overcome.” It is a philosophy he puts into practice on all projects large and small. It is a way of living that he imparts to his employees and those who are working to become part of his team. People handle hardships differently. Many people view being laid off from their job as devastating. Others practice constant vigilance in seeking out opportunities. They seem to be able to navigate difficulties with grace, and even find advantage in their situations. 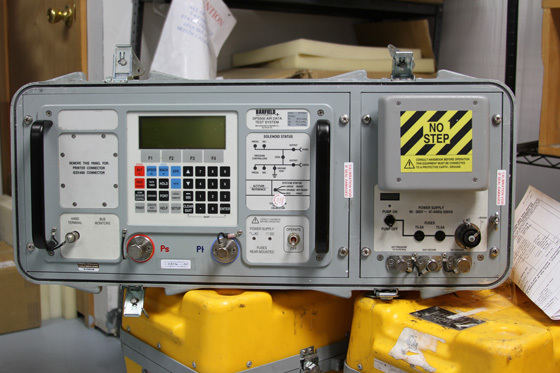 White was working for L-3 Vertex in 2004 in a dedicated calibration lab. When L-3 Vertex announced that they were downsizing, including closing the lab and eliminating White’s position, he saw an opportunity. Upon hearing the news, rather than seeing defeat in his circumstance, White decided instead to make an offer to buy the equipment from the lab in order to start his own business. White’s unconventional response paid off when L-3 Vertex accepted his offer. Two weeks later White had secured a 1,000-square-foot space, and AA Calibrations was born. His former employer became his first client. After White and his wife, Dorothy, who serves as Chief Financial Officer, established AA Calibrations, they immediately began seeking advice on how to navigate the business startup waters. They were determined to take the right steps. White credits the Mississippi Development Authority with being particularly helpful, as well as Mississippi State Senator Horne, U. S. Congressman Thompson, and Henry Cote, former president of the Yazoo County Chamber of Commerce and former president/CEO of the Yazoo County Economic Development District. Over time AA Calibrations was able to establish statuses, certifications, and associations that would help them in their startup period, including the Historically Underutilized Business Zones (HUBZone) program, the 8(a) Business Development Program, the U.S. Department of Transportation’s DBE (Disadvantaged Business Enterprise) program, the Mississippi Manufacturers Association (MMA), City of Jackson, and the Small Business Administration Service-Disabled Veteran-Owned Small Business program. Today both Larry and his wife Dorothy draw paychecks. To meet the demands of their expanding business, White needed employees — skilled employees. 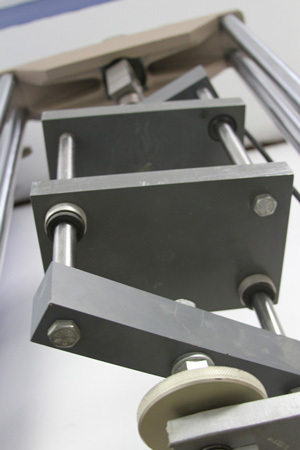 Calibration is a precise business, and qualified technicians are extremely difficult to find, whatever your location. White decided to meet the workforce challenge with education. He sought the aid of the WIN Job Center in Yazoo City, which funded an in-house on-the-job training (OJT) program where White personally oversaw the development of the skills he needed in people while they worked. Says White, “We brought in people who were eager for the opportunity to better themselves and work their way to a skilled and valuable position.” White was not only developing skills, he was helping develop value and self-esteem in his new team. While OJT was effective, there was only so much White could do by himself. He needed a way to train more employees more quickly, and help even more people in the process. 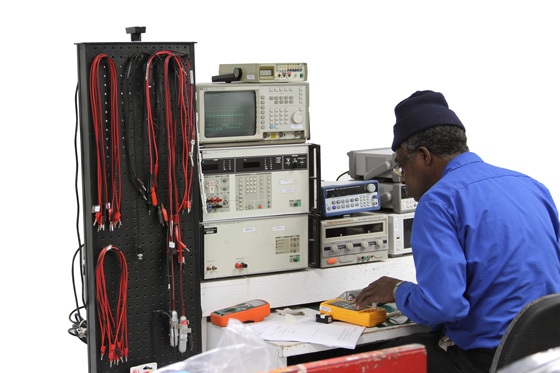 The Holmes program provides 121 hours of electronics and metrology coursework over a 30-week timeframe. One of the final assignments for students is to design and build their own functioning power supply, which demonstrates a working knowledge of all of the components. There have been 16 graduates from the program to date, and all but four have gone on to work for AA Calibrations after graduation. A Business Worth Building, Lives Worth Mentoring. “Adapt. Adjust. Overcome.” is the motto Larry White instills in all of his employees. Navy veteran Larry White took a layoff and, with his wife, turned it into a growing business, an outreach program, a college certification program, and a path for under-educated people to develop skills and build careers to better their lives. And they did it all by themselves, from scratch, with personal savings. That is a story worth sharing.